Travelling to Ushant Island is no longer the perilous journey it was before. The fastest route takes but an hour by boat from the Breton town of Le Conquet to reach the Island’s eastern cliffs. Yet from the moment that the ferry drifts into Ushant’s tiny port, one is still struck with the feeling of having reached the final outpost of civilization – a thrilling, slightly surreal sensation, often accentuated by the presence of wild seals or dolphins playing among the boats. The nation’s most westerly edge has been a maritime graveyard for a full millennium. 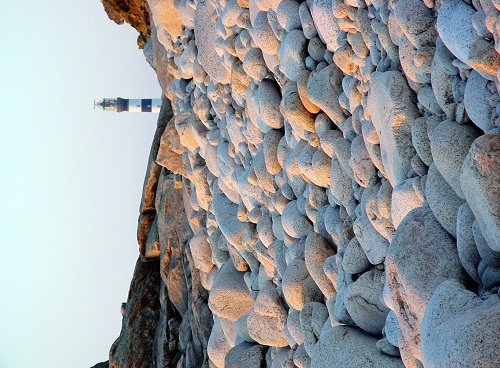 Ushant’s lighthouses are smashed by the boiling seas made famous by Jean Guichard’s whitewater photoscapes. The Phare de la Jument rises from the Atlantic to blast three red flashes every 15 seconds. Phare du Créac’h lights up the sky from 120 km away and purportedly boasts the most powerful lighthouse glow in the world. Each serves to keep sailors away – not to invite them in. Perhaps that’s why those who do land on Ushant are welcomed with open arms. The island’s only town, Lampaul, will serve you a captain’s feast of turbot roti and crab salad, then tempt you with an ice-white sandy beach.